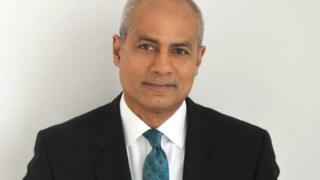 BBC News presenter George Alagiah has been diagnosed with bowel cancer. The presenter of the BBC News at Six and Ten and GMT on BBC World News will take a break from his on air duties while he undergoes treatment. A statement from the BBC said: "He is grateful for all the good wishes he has received thus far and is optimistic for a positive outcome." It added: "George asks that he and his family are given the space and privacy they require whilst he recovers." The BBC said the news programmes would be presented by "familiar faces... until such time as George is well enough to return to work". The statement continued: "Our thoughts are with him and his family and we send them our very best wishes during this time." Alagiah, 58, first joined the BBC in 1989 and spent many years as one of the BBC's leading foreign correspondents before moving to presenting, reporting on events such as the genocide in Rwanda and the conflict in Kosovo. He was made an OBE in 2008's New Year Honours.